When I was approached to write about your work, I began by simply looking at your images online, not able easily enough to see your work in place. I began simply by jotting down notes over the time I had to prepare, looking at updates of your website. Additionally, through those updates I ALWAYS avoided your written artist statement and actually avoided asking you questions directly about the work. I just don’t work any other way- anymore. So this is a rather cool, if not cold read of your body of work. It begins with art history, one of my passions and the lens through which I see your work. My initial notes began with a comparison of the composition of one of the works mentioned below to the idea of a Flawless or Faultless Aesthetic and grew from there. A few years ago, I taught a Modern Art History course, where I began by asking the question, “When did Modern Art begin?” I gave three options, which the students would argue in their assignments for the better part of a week. With the options of Edouard Manet’s, Le Dejeuner sur l’herbe (1863), Gustav Courbet’s L’Atelier du Pientre: A Real Allegory of a Seven Year Phase in my Artistic and Moral Life (1855) or, lastly Jacque Louis David’s Oath of the Horatii (1784) the students were quick to point out that the range of options covered nearly one-hundred years of solitude by artists working in different modes of PAINTING. Here they were PAINTINGS, but “PAINTINGS” as something else, not strictly narrative, not sculpture, yet most definitely concerned with space. 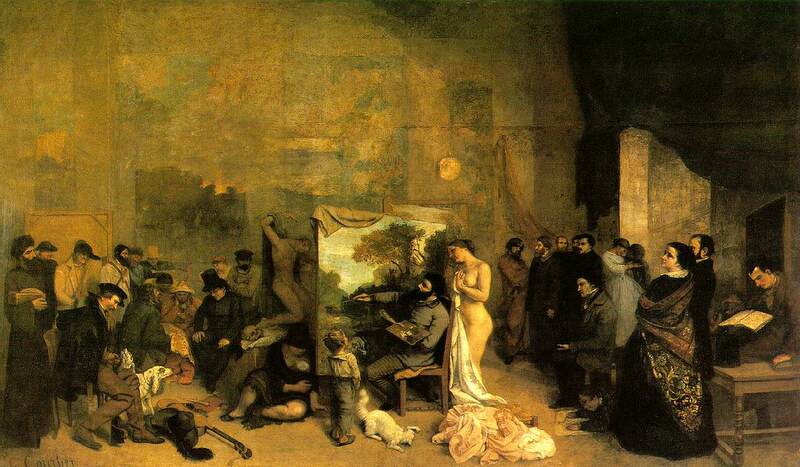 For the sake of the song, let’s take a close look at Courbet’s painting studio, and the allegory of the artist’s artistic and moral life. In your work and the work of Courbet there is a mirror turned to reflect some truth in content; reflecting varied interests, aptitudes, and inclinations as these “mirrors” can. In the case of Courbet, we see his ability to communicate a nearly sculptural or filmic autobiographic index about the artist and his life. The way this index works is not dissimilar to the way you have constructed your wall-based reliefs through which the audience is brought into your time-collapsed world of material choices, color sensitivity, and textural affinity. 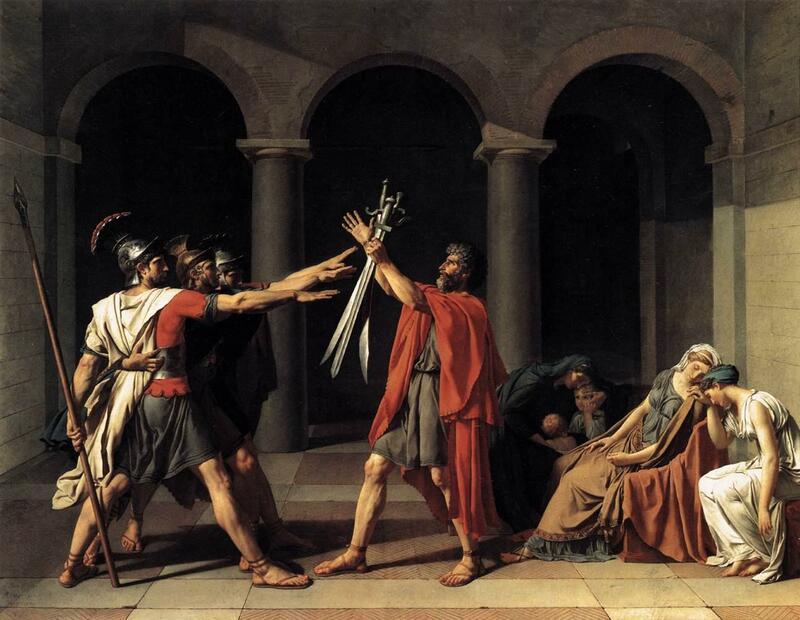 The work which I originally thought in opposition to your work was the Oath of the Horatii. When we look at it, we see a composition with great power that may be formulaic in conception and rigor, that rigid triangle, with the arms raised to take the oath but one can’t see a strong argument for the re-placement of any compositional element. This approach to constructions in space; flat, round, positive or negative, caused me to pause to consider how these self-same decisions were made in your work. What may at one moment seem like casual placement, may have taken hours of the long look. I also chose the Eiffel Tower as a point of departure and comparison to your work based on how your work is engineered and discovered, how the “rules of the game” can and do change simply because we will them to do so. The tower was never meant to be a permanent masterpiece of engineering but was rather to be a structure that would stand for only twenty years. 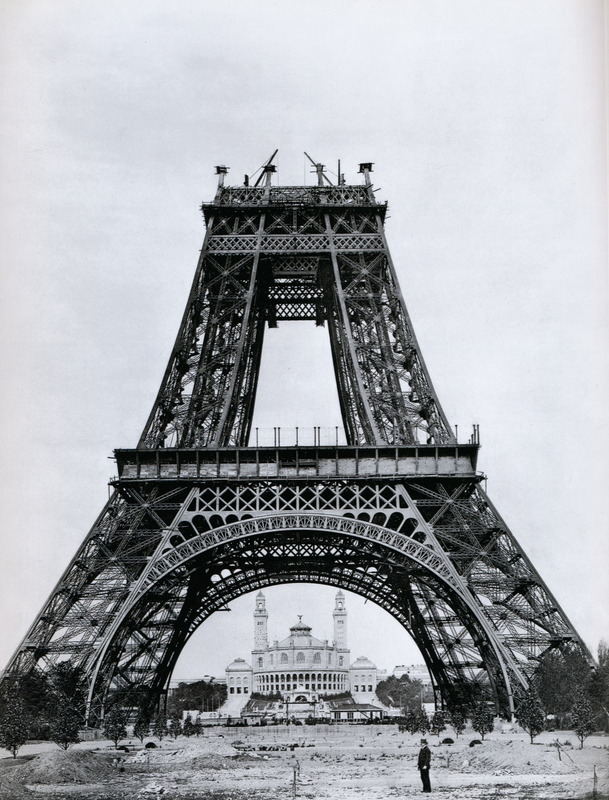 The original vision for the tower was to unify the worlds of architecture and therefore design and art with engineering, and therefore mathematics and science. Of the few initial construction requirements, the only one which was actually held fast through construction was that there be no drilling or shaping on site. This meant that anything that didn’t fit would have to go back to the factory to be reshaped or drilled. These Eiffel ideals recall the compositional constraints of David’s Oath of the Horatii and seem to possibly stand in direct opposition to works in which their very existence depends on the artist being in the moment. But what remains present in both is a flawless aesthetic, which also shows in your work. 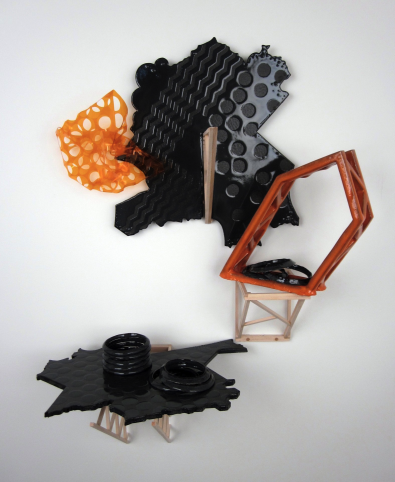 To another end, Jessica Stockholder and Peter Voulkos are artists with that Faultless Flawless Aesthetic. From a strictly formal point of view, it is very easy and also very difficult to argue the decisions that they make in their work. The next time we look at one of Voulkos‘ formidable Stacks, let’s look at the sgrafitto. Can the work stand to BE without it? Should he have lopped off another section and replaced it somewhere else, or will that porcelain plug simply not do? On our next visit to the Whitney, we can argue for hours in front of Jessica Stockholder’s, No Title (1995) about the number or placement of the acrylic yarn, or how the electric cord is or should be coiled. In the end there can be no resolution, no real answer, no mathematically finite finish answertime. It becomes clear that, much like in your work, this art is an art of choices, like Stravinsky swimming. Could be a pool, could be the ocean. Igor Stravinsky’s musical compositions represent a complete freedom that can only be found in relation to strict rules. 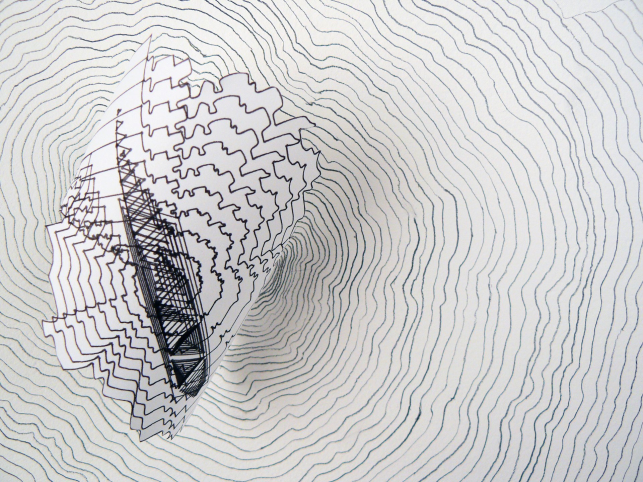 His decisions hold sway as we navigate the choices and tributaries within his work. Questions abound and answers are served up. When the timing of the work is so crucial, I am reminded of other crucial origins from the natural world, moments full of grace, where IT opens to us, when we see that single leaf left on a tree or the moment a water lily opens. There is a beautiful pop not dissimilar to the pop one makes when the index finger is inserted betwixt two tightly closed lips and the palm side of the hand is pushed away from the face. In both instances there is a moment, beautifully dubbed decisive by Henri Cartier-Bresson in which everything comes together in an A-Team like fashion. It happens in The Oath of Horatii, it happens with Harold Edgerton’s time lapsed photography of milk splashing and also with the choices you make in your work. Chaos/ Control, Beauty/Indifference, in fact everything time/space coalesces and everything is truly F.I.N.E. fine. ← Just a friendly reminder – Register to VOTE by Tuesday, October 9th!